There are times when you may be out on a mission to photograph a subject or a location that you have planned out. You know exactly how you are going to take the picture, how you are going to compose it, and how you are going to process the final image. then there are times when you are out, and you stumble across a cool location or you happen to be in the right place at the right time. This was one of the later. I was just a couple weeks into my first ever 365Project, I had planned on shooting all my photos that week at night. I like night shoots, they are different because most people don't think of shooting as much when the sun goes down. I think anytime you can get to a location to make a photo look different from anyone else that shoots it you have done a good job to photograph it. One of the easiest ways to do this is to go out to shoot at night. For this photo, as I said earlier I stumbled upon the location. 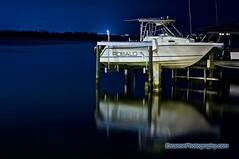 the photo that I wanted to shoot at this location was going to be a long exposure of the drawbridge in New Smyrna Beach, FL. I wanted to capture the motion of the bridge as it raised and lowered, unfortunately, the hour or two that I was there might be the only time I have not seen any boats on the river. Not to let the opportunity go lost, I looked for some other shots. I had made some shots of a boat dock on the south side of the bridge in front of the Riverview Grill, and I was on my way back to my truck when I happened to notice how the light house in the distance was acting as a backlight and creating a silhouette of the land across the river. There was also this boat just sitting there in a lift out of the water. The boat itself was being lit by the orange mercury vapor streetlights on the bridge. I set up the shot by setting my tripod right under the bridge, and took several exposures. For each exposure I was trying to time it just right to get the moving light beam from the lighthouse to sweep through the picture as it was being exposed, it took me a few tries to get it right. the final ingredient of this photo came along in post processing, and was sort of a lucky accident. As I said the boat was illuminated by orange colored light from the streetlights. A simple adjustment in Aperture2 of using the White Balance dropper tool to click on the hull of the boat and instantly the boat was colored properly, and the water and the sky in the background took on a cool deep blue hue.